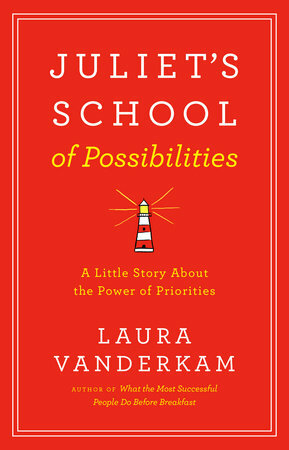 Regular readers of the Path Forward blog will likely know that I’m a big fan of Laura Vanderkam. I find her approach to time management really helpful. I also like that she’s actively trying to bust myths about what is possible for women, men and families. With that I’m going to admit that I was a bit unsure if I’d like her latest book, Juliet’s School of Possibilities: A Little Story About the Power of Priorities. It’s the “little story” bit. This is a fable. There is a long history of business fables — the most famous are Who Moved My Cheese? and The One-Minute Manager. I’ve never been a fan of fables. I find them kind of hokey. (The spoof, Who Moved My Blackberry?, on the other hand … ) But I really love Laura’s writing and she offered some really cool bonuses for pre-ordering, so I decided to give it a go. I’m so glad I did. It’s a really charming story that illustrates many of the concepts that Laura has talked about in other books, but in a fresh and illuminating way. The central theme of the book — “Expectations are infinite. Time is finite. You are always choosing. Choose well.” — is one that I think anyone can relate to. But the messages will, I think, resonate especially with moms who too often feel as if they are always choosing badly. If you read this blog because you are a full-time caregiver who’s considering a return to the workforce, this is a gem of a read. First of all, it’s really short. You can finish it in one or two reading sessions. But it packs a lot of wisdom into 113 pages! As a bonus, the book includes both a workbook for uncovering your own priorities and a set of group discussion questions. Can’t imagine how to fit a new job into your still-packed schedule? How to balance the ongoing needs of your family with the needs of a new employer? This book can help you shift your mindset.